Jeremy Clarkson tweeted this image of his Top Gear co-presenters holding a sign to his head last night. But he quickly had second thoughts and deleted it shortly afterwards. I have deleted my last tweet and would like to apologise profusely to anyone who I upset while I was asleep. Although it hadn't gone unnoticed, particularly by Piers Morgan. Embracing homophobic slurs with your petrol-head mates @JeremyClarkson ? And you have the brass flabby neck to call ME a ****? Wow. Not when he tweeted and then deleted it &gt; RT @sammyjowymer: @piersmorgan @JeremyClarkson he was asleep, you moron. Not when he tweeted and then deleted it > RT @sammyjowymer: @piersmorgan @JeremyClarkson he was asleep, you moron. 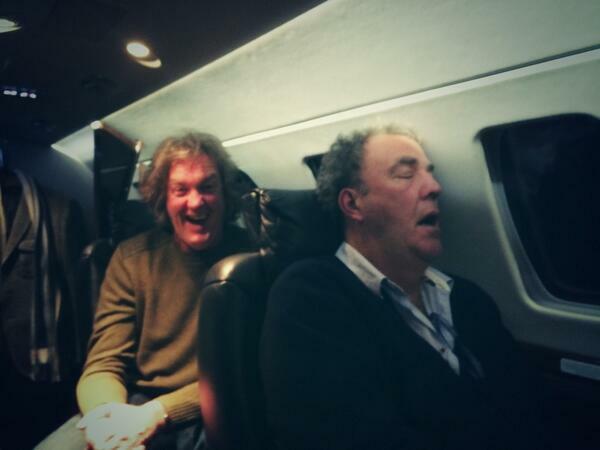 Richard Hammond has since shared a different image of Jeremy sleeping, minus the homophobic insult.